The Government of Northwest Territories is developing a recreation management plan for the lands outside and around Yellowknife, Detah, and Ndılǫ that are well-used for outdoor recreation. Finalizing the plan for the Yellowknife periphery area is identified in the mandate of the 18th Legislative Assembly. Why make a recreation management plan? The purpose of the plan is to provide direction and guidance for the management of outdoor recreation resources and opportunities in the area. How does this work fit with land claim negotiations? The study area is within an area of active land claim negotiations. The land management system is very likely to change because of negotiations, and the GNWT will reconsider the recreation management plan for this area to align with the changes. Certain lands have been withdrawn from disposition to facilitate land, resource, and self-government negotiations. The withdrawals ensure that new third party interests are not established on land that is under negotiation for land selection. Where is the planning at now? In the summer of 2016, the GNWT completed initial public engagement. A summary engagement report which outlines the feedback gathered, is available online. The preliminary draft plan is currently under review by Indigenous governments and organizations in the area. A draft plan is expected to be released for public comment in fall 2018. 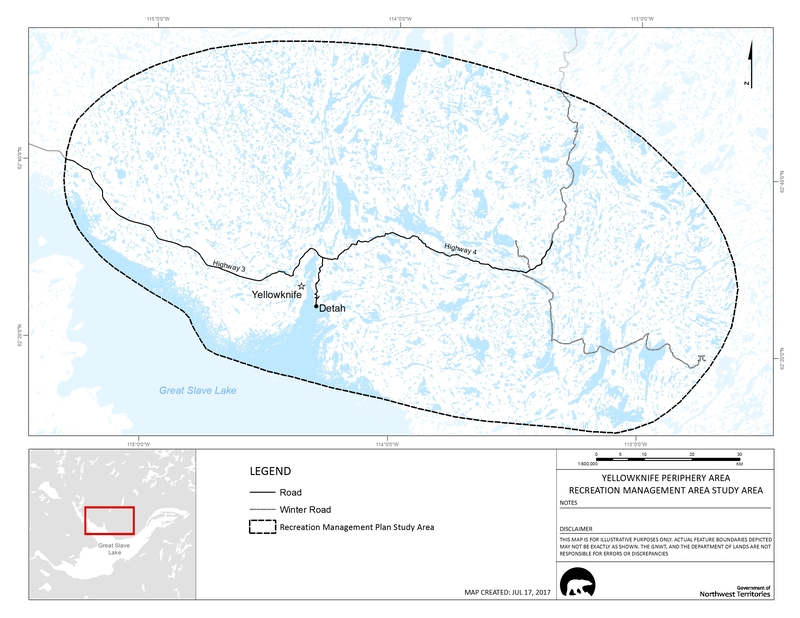 The final plan for the Yellowknife periphery area will provide direction and guidance to the GNWT for the management of outdoor recreation resources and opportunities in the area, in a way that is transparent, consistent, and reflects public values.